Disclaimer: This review was requested by Qoppa Software. I was contacted by the PR person of the company behind PDF Studio, asking me to test and review their PDF software product. 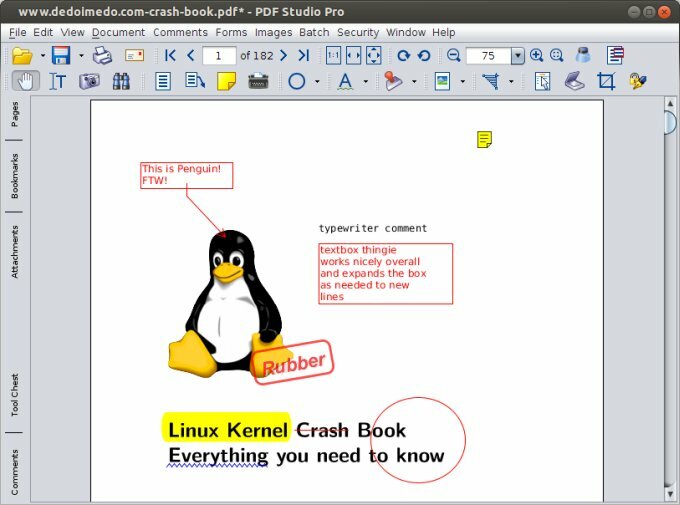 The notable selling points mentioned were advanced featured compared to Okular, which I played with in my Linux software comparison article, ability to edit content, and even OCR, which is always a hot topic. Available for all major platforms, which makes it quite interesting. After confirming the team was willing for me to go ahead in the case the review turned out to be negative, I got a serial key for the Pro version of their software. 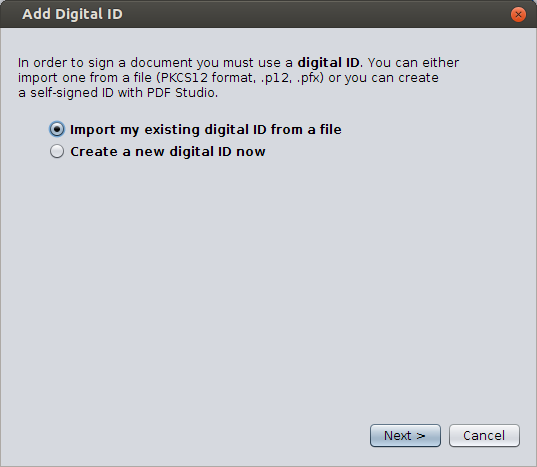 As it happens, if you do own a key for PDF Studio Pro 8, you are eligible for a free upgrade to version 9, which includes form creation. But more about that, and the price, a while later. Now, let's focus on the technical bits and pieces. I decided to try the program on Linux, using Salamander as the target platform. Debian installer files are available, but the default download option is a generic shell script, which ought to be good for all platforms. The installation was quick and simple. 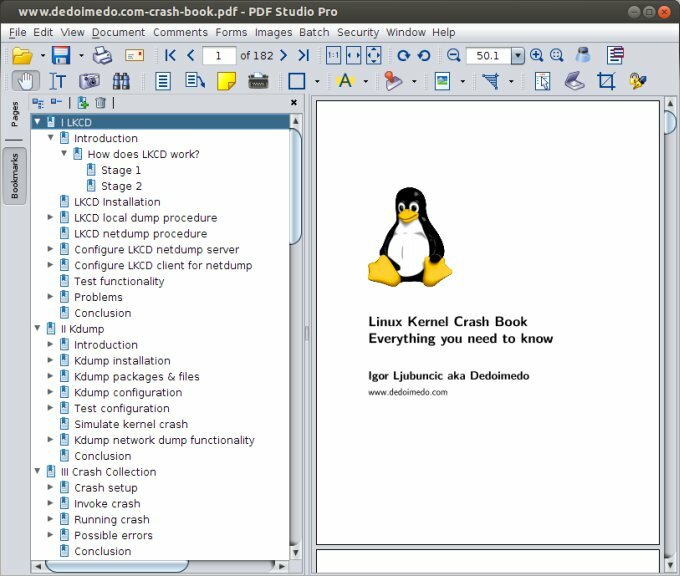 You can setup the software in your home directory, so you do not even need sudo to enjoy it. Then, it can also check for updates, which is quite neat, and allows you to go around the problem of not managing the program through the default package manager. The self-update, plus home directory permissions are really good for common users. 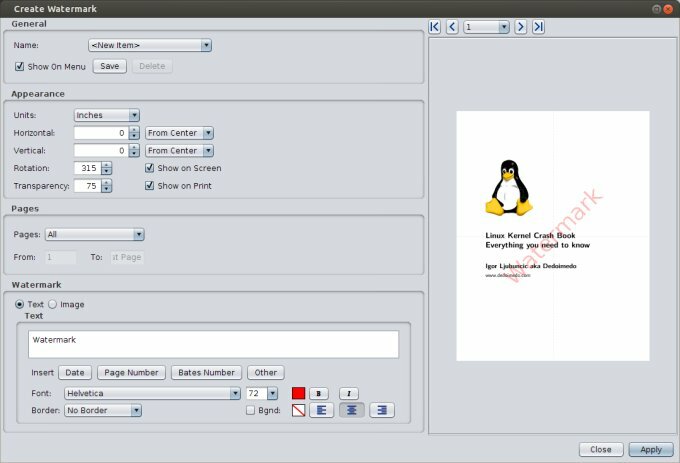 The GUI skin is not the prettiest, probably because it is designed to be common across all platforms, so you get a generic kind of Java looks that feel outdated and take away from the underlying potential of this software. So definitely something worth considering. 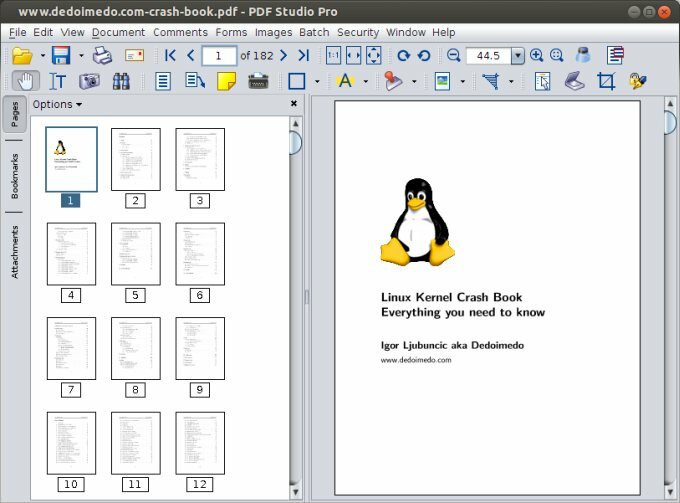 To see what PDF Studio Pro could do, I downloaded my own Kernel crash book and opened in the software. So far, it behaved like any good PDF program. You can browse through bookmarks or page thumbnails, or even view attachments. 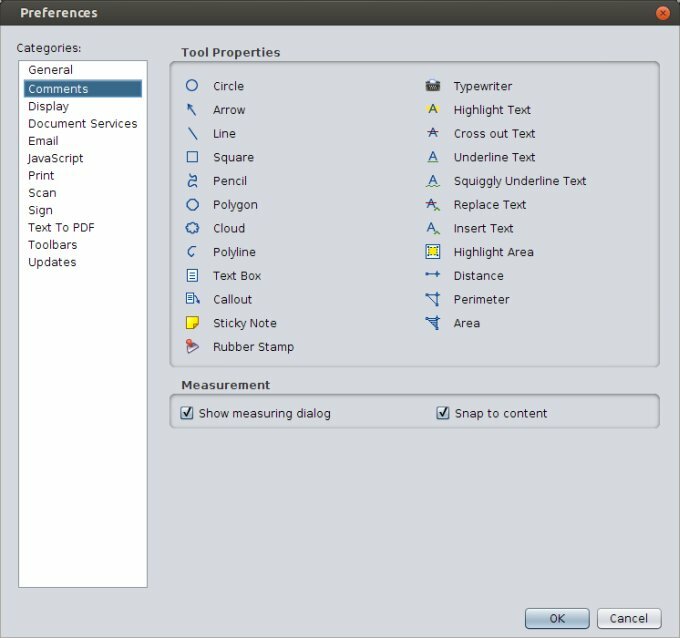 The truth is, PDF Studio has a lot of features, and it can be overwhelming just to try using it. You do need a bit of time to figure out all the options and settings and slowly start exploring them. 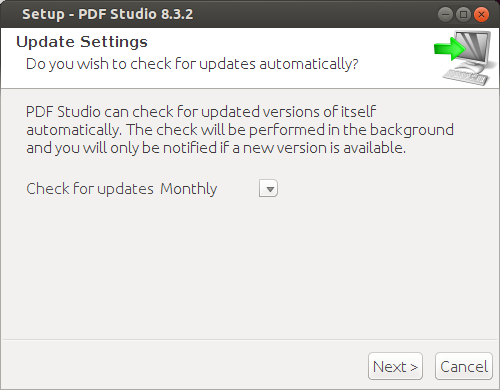 For example, the Studio will let you split or join documents, so you do not need to go manually about doing that. 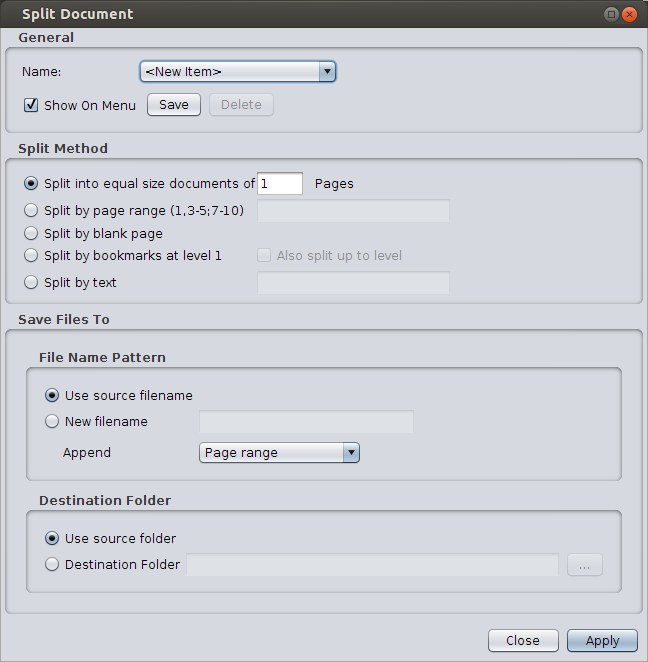 You can do page range splits, blank page splits, or even use text markers. 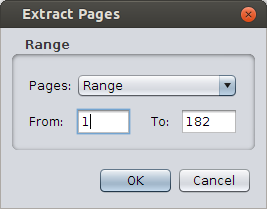 Likewise, you can extract pages from the document, or export pages as images, which can be quite handy. The biggest focus is on the editing and collaboration tools, which means the program lets you massage your PDF documents any which way you want. You can add comments and notes, use auto-expanding textboxes with or without arrow pointers, stamps, geometric shapes, as well as mark text in multiple ways. You can also add watermarks, including several presets, or your own custom ones. For me, the most impressive part is the ability to edit parts of the text embedded in the documents. You can actually select pieces of the article text and make changes, including font size, shape, color, spacing, and even the actual contents. 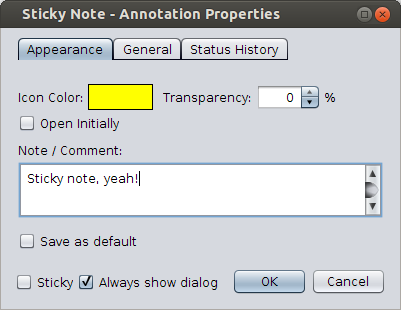 This can be a great thing for fixing tiny typos, especially if you no longer have the original sources. And still much more. You can add media files to your documents, attachments, compare documents, and the list keeps going. Some of the rest of the stuff may seem trivial, like the Loupe tool, but you really need to invest time going through the menus and settings and checking all the available features. The preferences window is rather easy to navigate, and it should help you tame the program well. 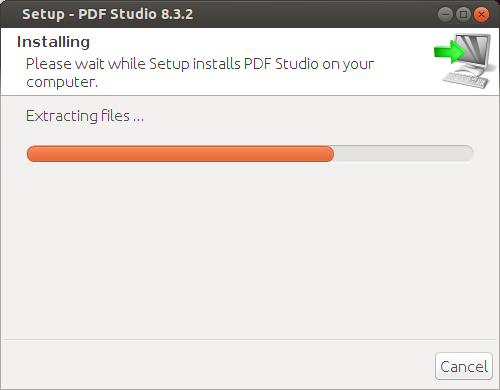 PDF Studio Pro is a very decent program, and it does live up to its promise. 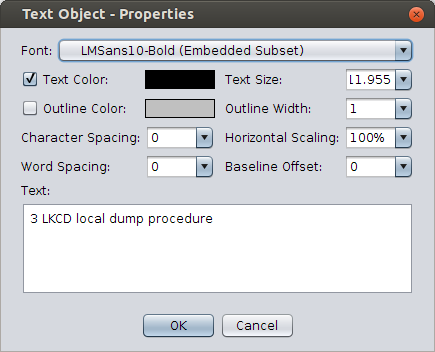 I really like the ability to make inline text edits, or to be able to export parts of the document as images. 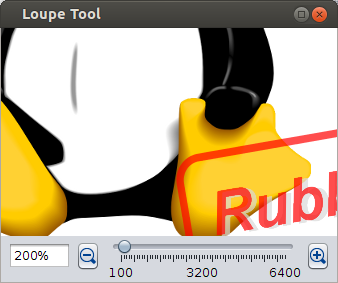 You also have a wealth of other tools available, so it surely won't be boring. The somewhat bland looks, the biggest letdown of this program, notwithstanding, the big question is that of the price. At USD89 for the standard edition, which lacks OCR and batch processing, and USD129 for the Pro edition, this surely is out of reach of most home users, and only people with a real interest in advancing PDF authoring and editing should consider the price tag. But let us compare to the competition. Adobe (R) Acrobat (R) offers its Pro version for Windows and Mac only, some of the stuff is limited to the Windows version only, and the price tag is even higher. So maybe USD129 is fine in the overall scope of things. 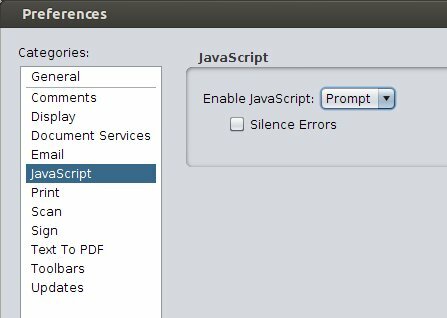 I have used the program for a couple of days, within my own limits as a totally awesome person and a somewhat less advanced PDF consumer. It worked well and without problems, the list of options is truly impressive, and the GUI is 1999 ugly. I think the program will work well for those with professional needs, and the price is reasonable given the market offerings. Anyhow, grade we must, so let's call it 8.5/10. And we're done.